The woman who praised Donald Trump's military policy and inquired about veterans jobs at Trump Hotel during a press conference on Monday was not a member of the press. 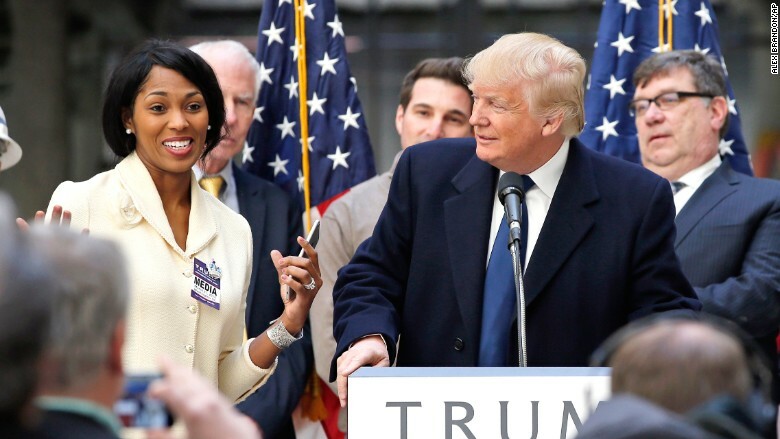 Yet somehow, Alicia Watkins, a retired Air Force staff sergeant who has appeared on Oprah, was given media credentials by the Trump campaign and permitted to ask a question of the candidate -- a question that quickly turned into an impromptu job interview. Identifying herself as a 9/11 survivor and Afghanistan/Iraq war veteran, Watkins asked Trump if his new hotel in Washington would include a veterans employment program. Trump said it would, and asked her to come to the podium for a job interview. "What are you looking for? What kind of a position? Come up here, you look so smart and good," Trump said. "Do you mind if I do a job interview right now?" Watkins, who came to the stage wearing a media credential, told Trump that she did "design," "briefs" and "all kinds of decorations." Trump then passed her along to one of his aides, and told the crowd: "If we can make a good deal on a salary she's probably going to have a job." The Trump campaign, which handled credentials for the press conference, initially told CNNMoney that Watkins worked for "a site called Troops Media which focuses on military and veterans issues." When told that there was no evidence of any such site on the Internet, the Trump campaign said it would look into the matter. In 2010, Watkins, then a homeless veteran, was featured on "The Oprah Winfrey Show." Last year, the show followed up with a "Where Are They Now?" feature in which Watkins said she had been accepted to Harvard University on the G.I. Bill. Late Monday afternoon, after this reporter tweeted that Troops Media did not seem to exist, CNNMoney received a call from a woman who identified herself as Alicia Watkins who said she would send an email explaining "why Troop Media is no longer on the Internet as of today." The woman, who said her phone was about to run out of battery, hung up while being asked if she still wanted to identify herself as a reporter. The woman called from a blocked number and did not leave any contact information. The promised email has yet to arrive. Meanwhile, the Trump campaign has yet to respond to an email asking why Watkins was given media credentials. Trump himself was asked about his exchange with Watkins after Monday's press conference. "What we just witnessed here is pretty remarkable. I mean, this is a complete stranger who came up and you offered her a job," a reporter asked. "I felt good about her," Trump responded "I looked at and I have a gut instinct. We're allowed to have that. I looked at her. She asked a positive question.... She seemed like a good person to me."